Good afterschool care in Gilbert AZ can be hard to find. It needs to be affordable, convenient, and provide a safe place for your little one. At A Child’s Place at the Ranches, not only are we affordable, but we can also pick your child up from school and transport them to our center. 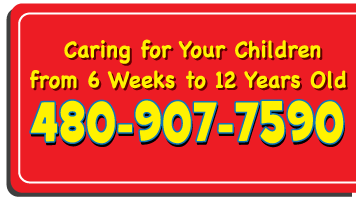 We make it a seamless operation and easy on your child. For information on afterschool rates and specific schools that we pick up from, please call us at 480-907-7590. Once your little ones are at the center, we will give them a nutritious snack and help them with their homework. Once they are finished with that, there is plenty of fun to be had! Whether it’s structured games with the other kids, free time, or playing outside on the play structure, they won’t be bored! They will also be well supervised the entire time they are with us. To A Child’s Place at the Ranches, afterschool care in Gilbert AZ doesn’t only mean right after school – it means on holidays and during the summer. We can provide care on the days when your child is out of school for a holiday, or on break. There are also summer camps available for school children up to age 12. Lots of options to fit your needs. When you’re looking for afterschool care in Gilbert AZ, take a look at our website to see our great program. We will take care of your kiddo just like you would. By the time you pick them up, they’ll be done with their homework and ready to spend quality time with you. Whatever your childcare needs are, we can help. Give us a call today to find out what we can do for you.